Taste test: Wachusett doesn't seem to make this flavor in a regular size bag, as I've only seen a 1 oz. bag available at deli counters and the like. So there weren't a lot of chips in this bag to begin with. These looked like normal Wachusett potato chips (flat style, not a lot of curves on them) with the level of flavor powder per chip ranging from a little to quite a lot. 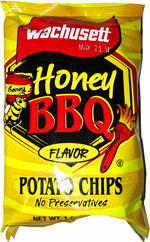 At first, I was turned off by the taste, as it didn't remind me of barbecue at all, but after eating a few there was a sweet barbecue taste, and there was definitely honey in the flavor. It's almost like they took a smokey barbecue powder and then added a honey powder. There was an abundance of powder left behind, an orange-yellow type of granular sugary residue that ended up on the fingers. So have a napkin handy. Overall, an average chip taste. Smell test: No barbecue smell per se, more like a salt and potato smell. 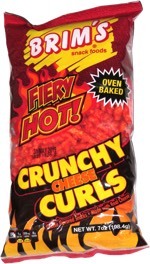 This snack was discovered by Keith at Ben's Deli, Southborough, Massachusetts. Review published .